Most change initiatives fail. This is a fact that too few leaders truly understand. Change is never easy. People are resistant to it and people will not just change because you tell them to. All it takes is one leader who wants to make their mark on a company to leave a sour taste, and the reception to change can be dead in the water for years to come. Most people realize change is necessary for sustainable results, but first, everyone involved with making changes to your organization needs to understand WHY change needs to happen. Failure to communicate this will cause people to focus on the potential negative ramifications of change rather than the benefits. This is why leaders must have change strategies to achieve desired results. 1. Expand involvement: While it sounds simple, getting people involved, engaging them in the conversation, and allowing them to have some influence on new developments will increase the likelihood they will buy in. You can do this by including your team in meetings, being transparent with your change management plan, and actively soliciting input from all levels of your organization. 2. Explore options: Leaders need to have a Plan B, C, and D. You need to explore your options before rushing into any decision that will significantly change the status quo. Involving others in the exploration process will provide you with multiple options, viewpoints, and insights – some of which you may have overlooked. Often, people closer to the issue have an insight that even the most seasoned leader will miss. So ask — don’t wait to be told! 3. Make the case for change: This is a must. If you don’t do this, you are probably wasting your time. If people don’t understand the root cause for change – and the expected outcomes, they aren’t going to buy in or support it. They may even try to avoid it or become an advocate against proposed changes. 4. 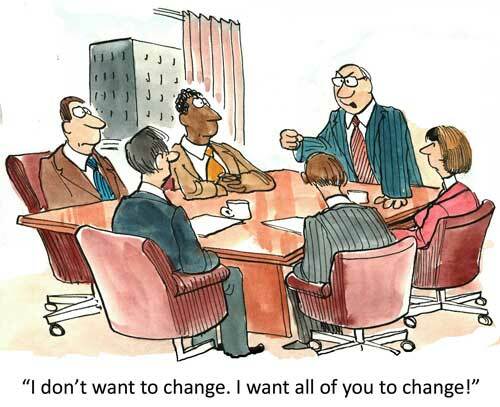 Create a change leadership team: One person cannot create sustainable change – it’s a team effort. Teams have more influence than individuals. Put together a team of advocates – make sure to include people at all levels so everyone feels their opinions are genuinely being considered. 5. Communicate your vision – and repeat: People want to know where change will take them in the future, so communicate it to them – and do it often. One and done will not work with change, so make sure you build in a strong communication strategy from the beginning. This will help put people’s minds at ease. It can also motivate and inspire them to buy in. 6. Support your people: Coaching, training and reassurance are part of any transition period in business. People will have concerns and questions about their ability to succeed in the new state, and having support mechanisms in place will help put their minds at ease and make a smoother transition. Use your advocates and early adopters to help others build their skills to achieve their best. 7. Hold people accountable: Accountability is vital. Leaders and team members need to hold themselves and others accountable or there will be a lack of compliance and buy in. 8. Focus on the long term — but build in short term wins: The objective is to create long term, lasting change. Don’t lose sight of your long term plan as you meet some of your short term goals. Celebrate and build on your short term wins, share best practices, continue to offer training and coaching and set new milestones that build on current success. Creating sustainable and long lasting results is a process. It’s a marathon, not a sprint. Implementing the above change leadership strategies will help you remain focused. The Wise Company: Is a Degree Required?